The class of 92 are out of Manchester United coaching staff leaving only Ryan Giggs to be assistant manager of the new gaffer Louis van Gaal. Long before van Gaals is reported accepting Man United offer as the new manager Giggs traveled to Netherlands to discuss something with the Netherland manager. After quite discussion with van Gaal Ryan Giggs announced his Man United coaching career. His responsibility as manchester united coach begins last season when he was appointed to be interim manager replacing David Moyes. Giggs coaching statistic was not entirely perfect, in the last 4 games in the end of 2013/2014 season he won 2 draw 1 and lost 1. However the fans and United's players were delighted with the prospect of one man club looking to manage. Twenty four years wears the glorious red jersey of Manchester United and tearing from the sides and now he just had to shout from the sideline. Louis van Gaal arrival also bring manchester united new coaching staffs. The new recruit are van Gaal compatriot in the Netherlands squad that are goalkeeper, Frank Hoek, and match analyst, Marcel Bout. The Netherland trio will be arriving at Manchester after the World Cup 2014 campaign ends. Frans Hoek begins his playing career at FC Volendam in 1972 to 1985. Before he begins his goalkeeper coaching career the last club he where he actively play as a player is Roda JC Kerkrade. Van Gaal and Hoek are always working together since he was interim coach at Ajax. He had work with Edwin van der Sar, Victor Valdes, Victor Baia, Michael Neuer and so on. I think we would like to see what kind of goalkeeper David de Gea and Andres Lindegard will become. Frank Hoek has his own method called "Hoek Method" to begin with he classified goal keeper into two characteristic. The first one is reactive goal keeper that is a goal keeper who never leave his goal line and reactive on goal attempts. Oliver Khan, former Bayern Munich goalie is the example of this definition. The second one is Pro-active goal keeper who represented by Man United legendary goal keeper Edwin van der Sar. This type of goal keeper is more involved with game situation by leaving his goalline based on his judgement. He join manchester united coaching staff along with Louis van Gaal. Both of them had work together in Bayern Munich. Marcel Bout position was the head of opponent scouting. 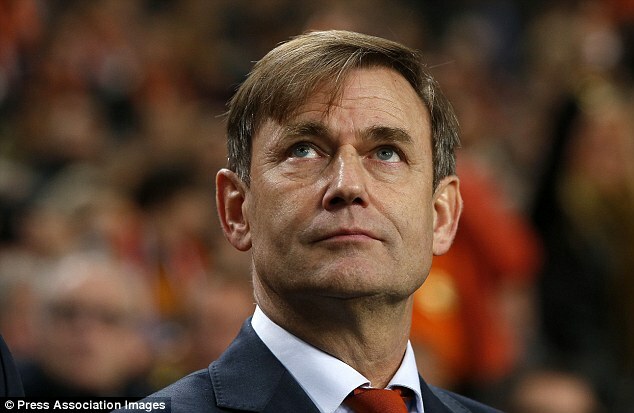 Just like Frans Hoek, Marcel Bout also had long experience of coaching and opponent scouting. Albert Stuivenberg is formerly Netherlands U-21 coach who led the team in 2011/2012 and van Gaal appoint him to harness United's youth structure. His position is as an assistant manager of Louis van Gaal. Jos van Dijk has worked with Louis van Gaal since his time at AZ Alkmaar and joined United as a training physiologist in the summer of 2014. Born in Utrecht in the Netherlands in March 1957, Jos spent four years at AZ Alkmaar – working in the same role as his current one - before following van Gaal to work at Bayern Munich, for the Netherlands and then Old Trafford. In his role at United, Jos is a member of the technical staff and coordinates with the medical and sports science departments on a daily basis. The planning and periodising of training sessions is a large and very important part of his day-to-day schedule, which takes into account the monitoring and analysis of the players’ fitness based on training and statistical data. Jos initiates actions to improve the required fitness of the players and the team, based on training and game data, and feeds all the information into van Gaal in order for the Reds manager to make informed decisions around training and individuals. Max Reckers' role as United’s performance analyst – collecting and analysing player data – illustrates the technological advances that have been made in the modern game. Working with a video operator at the Aon Training Complex, Reckers is able to provide a minute level of detail on players’ performances during matches. That information is passed on to the Reds’ coaches and to the players themselves, in a bid to ensure continuous improvement. "When we see something we want to analyse, I can touch a key and record the game in real time," he said. "If the coach wants access to any piece of information, we can get hold of it immediately. We use a lot of video cameras, as well as tracking systems, which follow the movements of the players and the ball. Those give you a new level of data, which we then process and use to give feedback to the players." Reckers leaves the job of presenting information to the players to "the people that matter to them" - Louis van Gaal, Ryan Giggs and Albert Stuivenberg. "We do a lot of research to see how long we can keep the players’ attention, so our sessions are very short and to the point," he explained. "We don’t over-exaggerate. We give them the key points, focus on them and move on. That flow works really well." A former hockey player, Reckers held a senior computing position at the Fontys University of Applied Sciences in Eindhoven when he was first contacted by AZ Alkmaar in 2007, to work with van Gaal as a full-time match analyst. After their successful spell in the Netherlands, he followed van Gaal, who describes him as a "computer guru" and as being "like my son", to Bayern Munich, the Dutch national team and, finally, United. Reckers says one of the end goals of a vision he began working on at AZ is to "come closer to the look and feel of the player", by analysing the game from the player’s viewpoint. It’s an example of how staying abreast of the latest trends is vital in roles like his. "We keep innovating, meaning that we demand that the players improve themselves every day and the same goes for the staff," he added. "We are always looking for new technologies and new ways to improve player performance. For us, it’s not doing science or having the technology; it’s just wanting to improve as a group."